Chayote is a squash-like fruit/vegetable(?) that is predominantly sold in markets in the veggie section. But, because of its light green and pear-like appearance some consider it a tropical fruit. It is originally grown in Mexico and Central America. The name varies from region to region. In Jamaica, it’s called “cho cho”. And traditionally it’s cooked in savory dishes like stews and soups along with other vegetables. 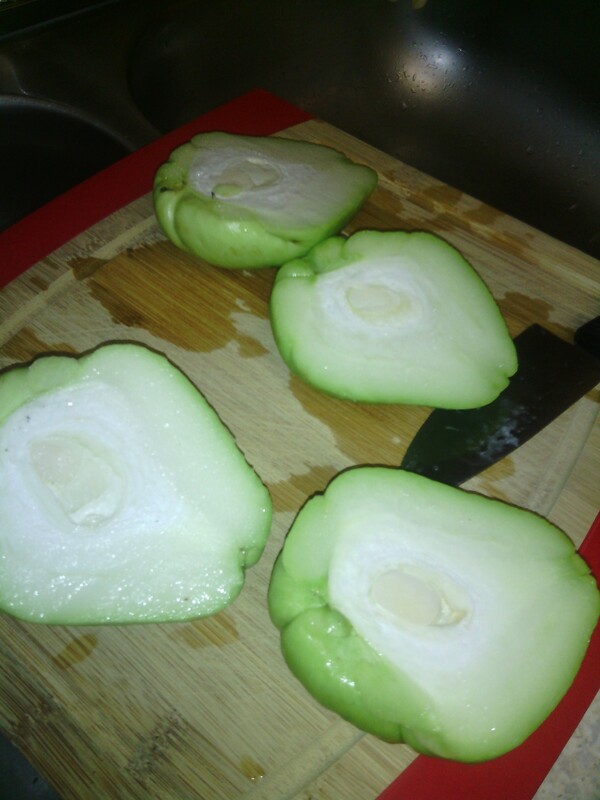 Chayote(cho cho)is loaded with great fibers and other beneficial nutrients. There’s no saturated fats. As a result, it’s excellent for the lowering of cholesterol in the body. It is said that because of its health properties, dietitians often recommend it in dietary plans. From my experience, cho cho tends to be bland in taste. And as a result, this squash like food needs to be enhanced with flavors in order to be more appealing. As a child, I can remember my dear mom sometimes treated it like mashed potatoes. She boiled it in salted water and then crushed it with a fork. Milk and butter were then added with a sprinkle of black pepper. It has been sometime since I’ve cooked cho cho. So I bought a couple of firm ones and decided to put my spin and continue on the savory route by stuffing them. 1. Rinse codfish with tap water and cook in stock pot for approximately 5 minutes in order to remove excess sodium. Repeat the process until fish is ready at your preference. Flake and set aside. 2. Cut cho cho in halves. In sturdy stock pot, add water along with salt to taste. Immerse cho cho in water and add a drop of vinegar and oil to prevent oxidation (browning). 3. Cook for approximately 25 minutes until they become fairly fork tender and drain. 4. Rinse under cool water and when cool enough to handle remove pit and discard. And gently use a spoon to scoop flesh. Set aside. Reserve skins for later. 5. In a hot skillet, add olive oil or any good oil. Quickly satay onions, bell peppers, zucchini, scallion, thyme, and broccoli. Season with pinch of salt and pepper to taste. 6. 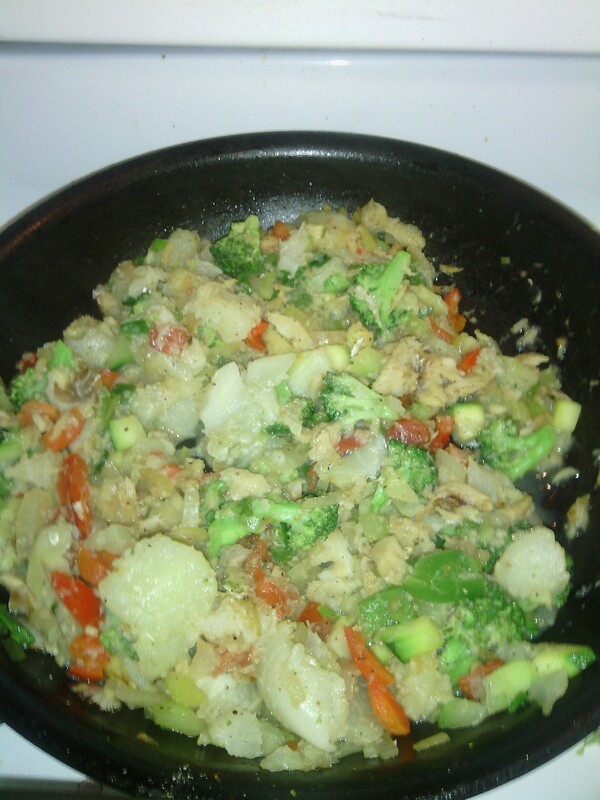 Add flaked codfish and cooked cho cho and gently combine. Remove from heat and sprinkle with bread crumbs to help in binding. 7. Spoon filling in reserved cho cho skins. 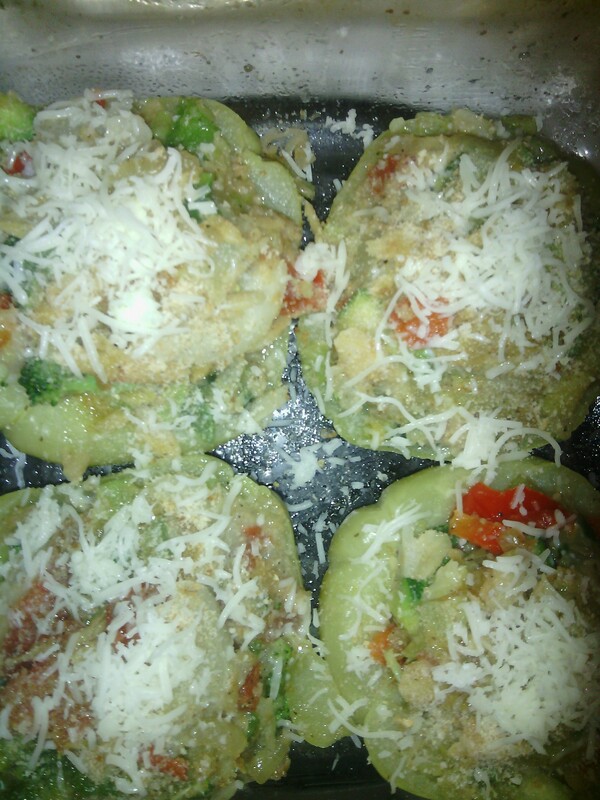 Sprinkle with shredded cheese of choice along with bread crumbs. Drizzle with olive oil. 8. Bake in a 420 degree oven for about 10 minutes in order to set. Put under broiler for an additional 5 minutes so as to brown the top. 9. Serve hot or at room temperature. Guys, was proud of my finished dish; my first attempt at stuffed chayote (cho cho).